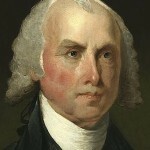 James Madison suggested the Bill of Rights in 1789. He realized that many people felt the new Constitution was not strong enough without some statements about individual rights. The Bill of Rights added the first ten amendments to the Constitution and became effective December 15, 1791. Children could read a kid-friendly version of the rights: Bill of Rights. Laki Volcano Began Erupting in 1783 in Southern Iceland George Wythe Died in 1806 in Richmond, Virginia.